This the classic space station image from the movie 2001:a Space Odyssey, directed by Stanley Kubrick in 1968. 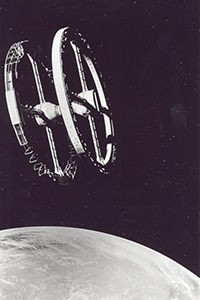 Praised for its special effects, the movie based its space station concept on Wernher Von Braun's model. : NASA on The Commons - 2001:A Space Odyssey Space StationThe Centre for Film, Television and Screen Studies at Bangor University will be celebrating the 50th anniversary of the legendary movie, 2001: A Space Odyssey in Pontio on Saturday 16th June 2018. “2001: Beyond 50” is a day of talks, music, and art celebrating the film featuring a wide range of experts and people who worked on the film. As well as an opportunity to watch this classic film, this will be an opportunity for the public to hear first-hand the experiences of those who worked with legendary director Stanley Kubrick on making the movie and to ask questions. Global experts will explore the film’s artistic, philosophical, psychological, religious and scientific legacies and the huge impact it has made on our culture and technology. Props from the film, as well as art inspired by the movie, will be on display and there will be a short concert of music from Kubrick’s movies, including 2001. This event will offer local residents, students, and visitors a chance to enjoy and learn about the vast impact of 2001. And thanks to the generosity of the British Association for American Studies, there are a number of bursaries available to subsidize the cost of registration for those who are on a low income, unwaged, or disadvantaged. This event has been organised jointly with the University’s College of Arts and Humanities, Centre for Widening Access, the Schools of Music and Creative and Media Studies, as well as the British Association for American Studies.